In a lot of places, it’s time for midterm exams. Maybe we could use a little escape? Here’s a good one. The plaque in the picture is mounted in a boulder at the top of Mt. Springer in northern Georgia. 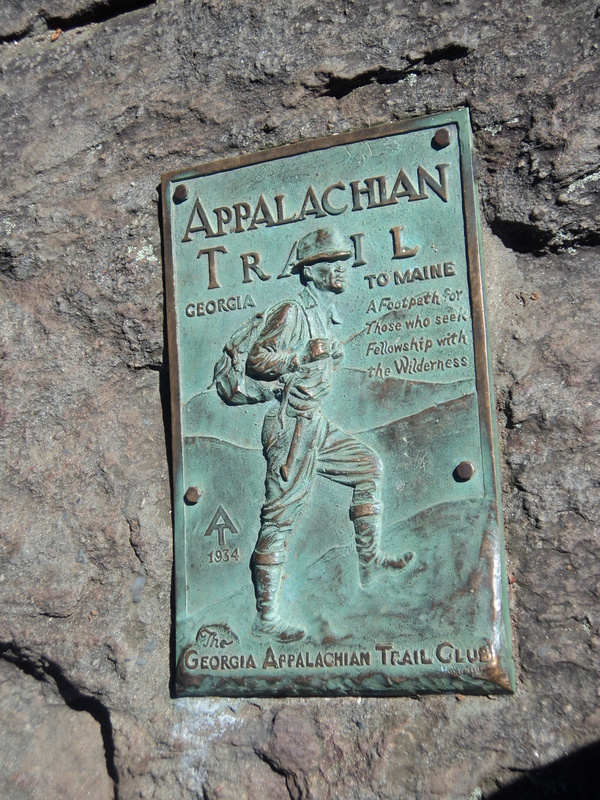 The brainchild of Benton MacKaye, a Harvard (well, of course) forestry agent, the Appalachian Trail stretches from Mt. Katahdin in Maine to Mt. Springer in Georgia. I’ll save us the walk (We’ll need our energy for studying. ); it’s about 2200 miles long. Benton started out alone but the idea quickly gripped people, galvanizing their lives in new directions and demanding everything they had. And people laid it on the line. This wasn’t for piddlers. So what does this have to do with the fact that we can’t decipher the notes we borrowed because we weren’t in class and the test roars in our face like a lion on garlic? And this class isn’t in my major. What good will it do me later? Excuse me, Dave, it’s time to change the IV bag of caffeine in my arm. Not so fast. Jesus said, “I am the way, the truth and the life…: (John 14:6) If we’re reading this, we’re either a Jesus follower or are thinking about it. Either way, He brought us to this campus (even that community college when we wanted to go to the university with five-star dorms) because He wants to show us His love, truth, beauty, holiness and power. And small pieces of things that show how He wants these things to sparkle in the clay of our live in years ahead. He wants to grip us with tastes and tears that will make us hungry to follow the Jesus Way. Now let’s talk about that class we had to take and don’t like. Whatever it’s about (The History of Glue, etc. ), that class brims over with people ignorant of the love of Jesus Christ. Maybe one of them lectures up front. Whatever the subject is fits into the scheme of the Kingdom of God; it stands as part of His Creation which He loves and died to rescue and repair. He loves what sits in those notes. When it says in Genesis 1:31 that God looked over all that He had made and saw that it was very good, He was including (at least in embryonic seed form) even the things lying on those pages and embedded in those notes we drag ourselves to study. If we love Him, we should give what He loves a go. He use these things to stretch us for the miles ahead on the Jesus Way. Blood Mountain sits near the southern end of the Appalachian Trail. It’s the last place hikers can get a bed, hot showers and a hot breakfast before they finish. Hikers going north can pick up any gear imaginable that they forgot. Tourists buy food and souvenirs. It holds an unusual book store where all those who finish the trail leave off the books they read along the way to get sold off to support the maintenance of the Trail. Blood Mountain is also a monument sacred to those who love the outdoors too much to stay out of it. Wires suspended from the ceiling hold hundreds of pairs of hiking shoes, names and dates written on the bottom. Rows of kits (large hiking backpacks) line the walls. A prosthetic left leg with a very worn out shoe fastened to the wall boasts of a very special accomplishment. People finishing the AT ship their gear back to Blood Mountain for display to say two things; I did it and so can you. Jesus Himself calls us to walk this Jesus Way. More than with Benton MacKaye, no one can imagine where this leads. “What no eye has seen, nor ear heard, nor the heart of man imagined, what God has prepared for those who love Him.” (I Cor 2:9) In Rev.4:10, the elders cast their crowns before the throne of God. Their crowns represent who they are, all they’ve done or accomplished. Jesus Christ calls us to this Jesus Way and it’s a long walk. This part winds through our campus, through every class, football game and late night gab session. Someday we’ll finish. But right now we’re working on our crown. I don’t know that He will hang them across the ceiling of heaven (I doubt it.). But our story will say, “Upheld by the Spirit of Jesus and driven by my love for Him, I did it and so can you.” So get to work on that crown and open that book. If we think this might encourage either a student or someone who loves them, then please share, Twitter, subscribe and all that social media stuff. If we already subscribe to geezeronthequad.com, then maybe we need to be part of Geezer 1, the Facebook clubhouse for all things Geezer. It’s a mix of students, student ministry leaders, professors, administrators, artists, writers, musicians, composers, pastors, theologians, broadcasters, booksellers, cultural thinkers and entrepreneurs and a few campus rats who think that Jesus Christ thinks that the university is a special place. You coming on board will make us better. Take a look and ask to join. If we don’t respond right away, resubmit since the Facebook dog may have eaten your homework. Please return your seat to the upright position and return your infrared night vision goggles to the attendant as you exit to the rear. See you next post at geezeronthequad.com. « geezeronthequad: Some Were There For Us Before We Were There.